of the hotel you can also have sailing lessons, diving and use the nearby golf and tennis facilities. The hotel is perfect for beach lovers of all ages. Overlooking the golden bay of Procchio, the Hotel Del Golfo is located directly on the beach and has, therefore, an exclusive view of the beautiful scenery provided by nature in this part of coast characterized by golden sandy beaches and deep blue waters. The hotel is at 100 m from the centre of Procchio, a charming seaside town which has several shops, bars, restaurants and cultural entertainment during the summer. 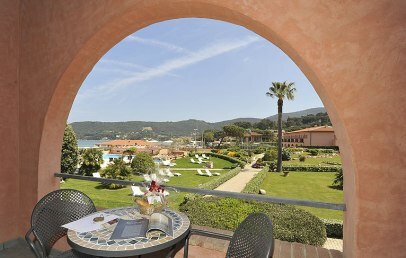 In the surroundings there are the port of Portoferraio (12 km) and the airport of Marina di Campo (5 km). The hotel is then in a crossroads position between these villages. Its guests can enjoy the beauty of the beach of Marina di Campo in front of the property or move to the nearby beaches of Cavoli and Fetovaia (Marina di Campo), or exploring the delightful coves of Marciana Marina. With extreme elegance the Hotel Del Golfo overlooks the bay of Marina di Campo, nestled in a green park, where the pines, oaks and a variety of colourful flowers surround the typical Mediterranean vegetation in harmony with the surrounding nature. 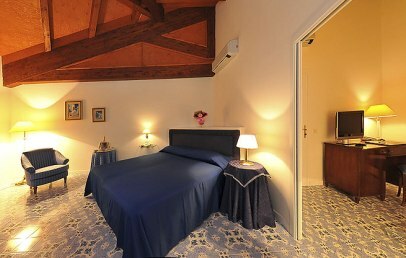 In the main building there are various services: reception, bar, restaurant and some bedrooms. The private beach has a pier for small boats. Renowned for fine quality service and careful attention to the needs of its guests, a stay in this little oasis will give you the possibility to dedicate yourself to sport activities or simply relax, totally detached from the rhythms of daily life and focus on your physical and spiritual wellness. 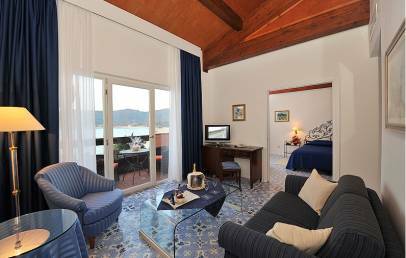 The 123 rooms of the Hotel Del Golfo are partly located in the main building and partly in the seven villas located in the park opposite the beach. The latter are characterized by their privacy and tranquillity. They are divided, according to their exposure, in Standard, sea side and sea view. The hotel also has some suites, which are more spacious and have elegant furnishings and are characterized by a nice sea view. All types of rooms are cosy and functional, equipped with all modern comforts. The hotel restaurant “Fontana”, located in the in the main building, has a wide terrace from where you can admire the breathtaking beauty of the bay. Here the breakfast is served with buffet style, and the dinner with table service. The “Fontana” is renowned for its excellent Italian cuisine, for an excellent selection of Tuscan wines and especially for the attentive service and class with which the staff usually pamper their guests. In addition, by the beach there is a bar and the restaurant “La Capannina” which opens for lunch time with menu à la carte (against payment). Meals for children 0-2 years are not included in the price of the cot: to pay extra on spot. Gentlemen are kindly asked to wear long trousers for dinner. The Hotel Del Golfo disposes of different services: private beach with two sun beds and one sun umbrella included in the price (for each room), private parking, WI-FI internet connection in the whole property, reception 24h, newspapers, 3 congress rooms and a professional staff for the organization of events, mini club for children from 4 to 12 years old (from mid June until beginning of September) and babysitting on request and against payment. Two times a week the hotel has evening piano bar and during the week in July and August dinners on the terrace with live music. Apart from a large sea water pool, the Hotel Del Golfo offers different sport activities: two tennis courts, soccer field, golf driving range at the Hotel Hermitage (6 km in area Biodola), horseback riding centre at 3 km from the hotel, a diving centre adjacent to the property, both for children (ages 8 and up) and adults, to discover the wonders of marine life in these crystalline waters. The “Sporting Beach” fitness centre adjacent to the hotel offers the chance to practice different activities (body building, vibration plate, body balance and pilates), with last generation equipment. For those who would rather dedicate themselves to the care of the body, the hotel provides its trained staff and professional aesthetic centre, which will pamper the guests with a beauty treatment or a relaxing massage. Large Suite on the top floors of the main building. These Suites have a bedroom with a wrought iron or upholstered queen size bed and a living room with sofa, desk, armchairs and table. Simple and classic taste with light wooden furniture, luxury curtains and textiles. The private bathroom, in Italian tiles or travertino, has a bath tub with massage-function, hairdryer, slippers, bathrobes and a courtesy set. Those rooms have cosy furnished balconies with table and chairs and a lovely view of the gulf. 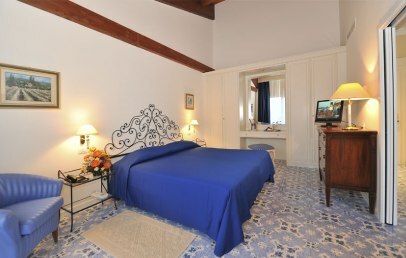 Nice double room in the main building or in the hotel villas. Simple and classic taste with light wooden furniture, luxury curtains and textiles. The private bathroom, in Italian tiles or travertino, has a bath tub with shower, hairdryer, slippers, bathrobes and a courtesy set. Standard rooms on the top floors have garden view balcony, whereas the ground floor ones have a little furnished patio with table and chairs. 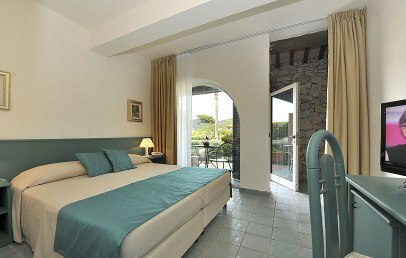 Nice double room in the main building or in the hotel villas. Simple and classic taste with light wooden furniture, luxury curtains and textiles. The private bathroom, in Italian tiles or travertino, has a bath tub with shower, hairdryer, slippers, bathrobes and a courtesy set. 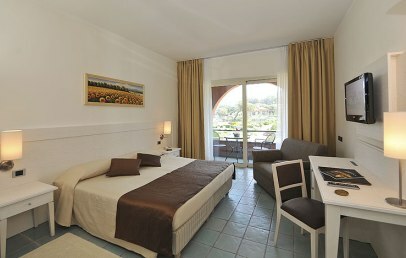 these rooms are sea side and have a little furnished patio or balcony with table and chairs. 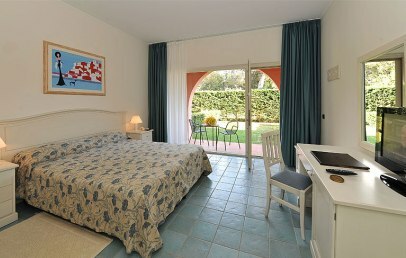 Nice double room on the first or second floor of the main building or on the first floor of the hotel villas. Simple and classic taste with light wooden furniture, luxury curtains and textiles. The private bathroom, in Italian tiles or travertino, has a bath tub with shower, hairdryer, slippers, bathrobes and a courtesy set. 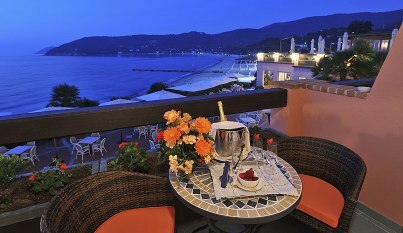 Those rooms have cosy furnished balconies with table and chairs and a lovely sea view.